On Reuters CRB (CCI) monthly chart I see a possible Falling Wedge which is different compared other analysts who see a sHs-pattern in commodities. Time will tell which is correct. We see some strength in Shipping which is related to activity in Asia/China. Shanghai is ripe for a move to the upside. Interesting stuff John. I have been thinking a lot about the Demographic ideas and not sure I buy into the theory in the sense that many countries are extending the years people have to work before retirement and people are living longer so pension fund capital is not necessarily being eroded. Not sure necessarily that the “older” generation necessarily only spend all their capital. I think a lot of it is sort of recycled to their children that continue the Ponzi process with more capital. Some of them just continue investing their assets in the stock market too. One could argue elegantly that the more older people the more speculation you can get as these people have more time to devote to the market than younger people busy at jobs. I think the only thing QE does is change sentiment. There is nothing real about the stock market than sentiment. Economics or whatever has nothing to do with it in my opinion. That is just stuff politicians use to convince people of their views. I only believe in sentiment which ultimately shows up in price. 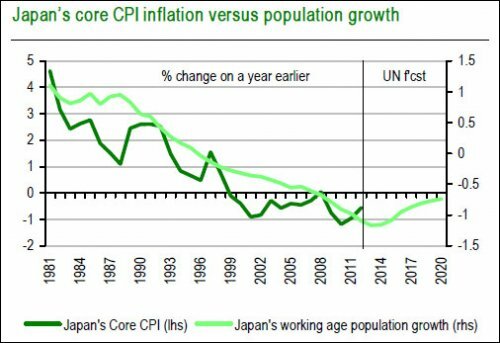 I do not believe the crash in Japan and the years it went down has anything to do with demographics but just sentiment. People got badly burnt after the crash and it took many years for the ponzi process to start i.e. change the mood. 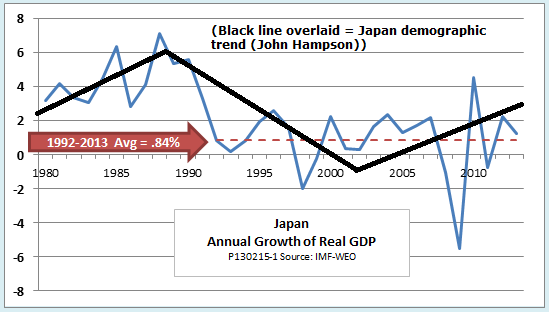 In the west QE has worked because it scares people of hyperinflation – in Japen they started the process too late. What I think is more pertinent is how a generation and the older generation reflects asset classes i.e. teaches their children. Ex. In the Nordics we have the mantra of residential assets. The older generation made a lot of money here so they tell their children to buy a flat etc. It is considered fail safe. It is not based on demographics but ultimately “belief”. Than various “funny-mentals” are used to rationalize the beliefs and feelings. Humans only use logic and reason to justify their emotional decisions. All decisions are based on emotion and then logic and reason is used to justify those decisions. That is why I only believe in trading that is mechanical based on price. 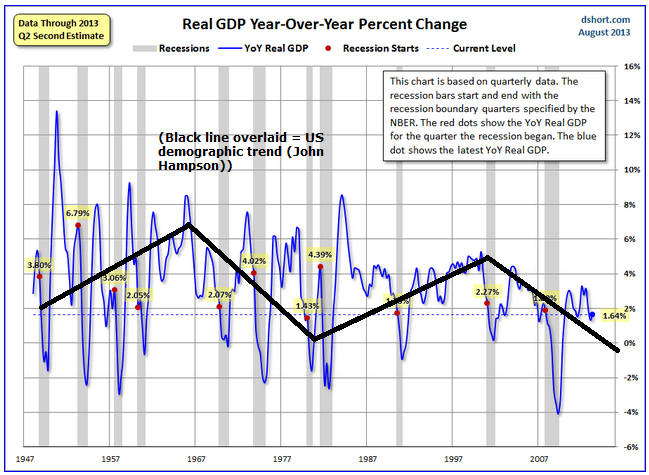 We are not trading some economy but we are trading beliefs and if there is enough belief the market goes up. The sun may alter our excitability as you are arguing but weather there are more or less people participating in speculation I do not think matters really – if prices go up more people get sucked into to that market whore anyways because of GREED. Seldom have I been able to find strategies were volume is a predictive indicator per say. It is predictive of large moves but they can be both positive or negative. If anyone has other views of this then pls let me know. There is no sane economic argument to be made for why Facebook for example is trading at crazy multiples but it does so based of people’s belief based on GREED and FEAR and that is what is real not what one thinks or the funnymental economics. Larry Pasevento says a good thing: Trade what you SEE – NOT what you THINK. Thanks Robert. Research backs up what you say: with up to a 1 year view sentiment drives prices; up to a 5 year view p/es (that’s demographics by my assessment); up to a 30 year view corporate profits. I definitely concur there is a way to profitably trade the markets using trade what you see and not what you think, going with sentiment, playing the middle part of a move not trying to call tops or bottoms. However, it’s just not for me. It’s the puzzle of trying to work out the global macro and predict the future that inspires me. Tops and bottoms can indeed be picked, and my methods have been profitable. If they ceased to be I would change. But ultimately, what you say rings true: my reason and logic justifies my emotional decisions. Yes. Everyone needs his own style and figure out the puzzle for themselves in my view. There is no other way. This is a good video. I think sentiment drives it all on all time frames in the sense that price affects fundamentals and not the other way around. Soros calls it the reflexive process. I hate being too sweet, so I would like to disagree with you guys about those ’emotions’. That the emotion comes first, then beliefs, then logic. The word emotion is quite empty for me. We humans have three brains inside our heads : reptilian, mammal and logical neocortex. The reptilian guy is the most important and will overrule two others. The reptile wants to eat, have power, have a female. It will allow the logic to try to get them. When it has all he wants – food, power, females, he will allow the mammal to be sociable and care more about the others. When not, it becames a bad reptile. Emotion is only a physical messenger of its will. Its will is in our subsconcious beliefs. For example, we meet a guy who, we reckon, wants to do harm. There is fear in us, it eliminates our goodness and forces the logic to act as it dictates. But firstly, there must be in us the concept of danger, concept of death, of a loss, realities or visions that we want to avoid. We must know or imagine how a dangerous guy behaves like. But everybody is a bit different so the perception of danger varies. Now, you will think I am crazy – we can convince the reptilian that death is good. That there is no danger. When the Russian soldiers defending Stalingrad in 1942 were told there is no land behind them, only in front of them and that there is no return, guess what they felt. RELIEF. But the deepest truth about trading psychology I got from watching…a TV program about dogs. Dogs and their owners. Dogs cause problems, are agressive, possesive, depressed and erratic only when they are in charge – pack leaders. Many owners allow their dogs to lead. But when dogs are forced to be subject to a leader (owner), to have confidence in them, they lose all their bad habits and behaviour stemming from inside of them. It means they are not in charge anymore, so their master’s will is what they believe and what they feel. The only reason why traders have problems with discipline, or behave in trading not like they want and later they regret, reason why traders experience so called fear, greed, hope and ignorance, it’s because they are in charge of trading, of their strategy and choices and their aim is to have a profit, to win with the market. I am as aware, tense and deep as when shopping on a Saturday morning. When I have running profits, I have to stay, hold and add, although its boring and takes my time. My reptile sleeps at my feet, it has nothing to say, its not in charge. What about a nice easy name like Peter or John2? There is nobody on this planet that can know what QE can or can not do or the results not even Big Ben. Every moment in the market is unique and it all depends on how traders ultimately behave based on emotion. It is dangerous to get married to an idea or view regardless of how logic it may appear, you only need one black swan to prove that not all swans are white. I thought that printing money was crazy and still think so but I have come to the point to just disregard it completely. It is irrelevant to make money in the markets. I think it is irrelevant to whether it causes the markets to go up or not. And especially the way I FEAL about it. There is no scientific way to argue that it is the cause of rising markets or that it will not work or has any effect whatsoever. We might believe so and it makes us fear but ultimately I think it just confuses traders and investors so better just disregard it. Thanks John for the article and you guys for your input. I read you with pleasure which makes me a bit uncomfortable. It’s easy to read, agree or disagree, however, a bit more difficult – although much more powerful – is to think and analyse for ourselves. My best discoveries came from my thinking; my system is thoroughly the result of my experience and my research. In the past, I tried to enhance my knowledge about the price action by reading some reputable TA books. Unfortunately, they caused a regress in my trading and I spent a year to undo the false beliefs they managed to sneak into my brain. Now, I can only laugh at them. Basically, those guys writers try to make a forecast based on some ‘in-chart’ elements, or behavior of an indicator below. With air of authority and seriousness, they fail to notice that in the very same chart there are one or two instances of the same element not working as they say it should. Besides, all their elements are shown with the benefit of hindsight, not how they look when they start to develop; the early recognition is more important than the way the ‘final result’ looks. Also if you let mr Right Shedlock and mr Wheatherman Faber poison your mind with their follies, you would need a year or two to shake it off. For me, forecast is a dangerous thing in the market. It’s useful to try to forsee, to form a personal bias, against which we read the subsequent price movement more clearly. But it cannot obscure our tape reading, and reacting to it. If we make a forecast to form a firm belief and produce a roadmap, we will not react properly to what is happening, in case our forecast is not right. I do have a collection of my DJIA day types, a colorful monthly grid with open types, daily ranges, how HTF looks like. I know how many ‘open test drives’ and ‘open drives’ we had in August. I know I must expect a trending last hour on a news day, or a range after a trend day. But this all doesn’t constitute a forecasting system for me, it’s only to show me how different days, trends and developments can be. Ideally, I don’t know where the price goes before the session starts. True, within 3 minutes I can asses with 80% accuracy what kind of open this is, and after 3 first 5m candles what day type this is. It’s a guessing system, probabilities assesement. I must say that somehow it looks similar to what John Hampson is doing with all his data, demographic, solar,technical and fundamental factors. John has a probable outcome, but also has other scenarios and keeps an eye on the developments. And let’s be honest, John is a skilled technician, too. He simply focuses on the most important element of the price action, the break-out. 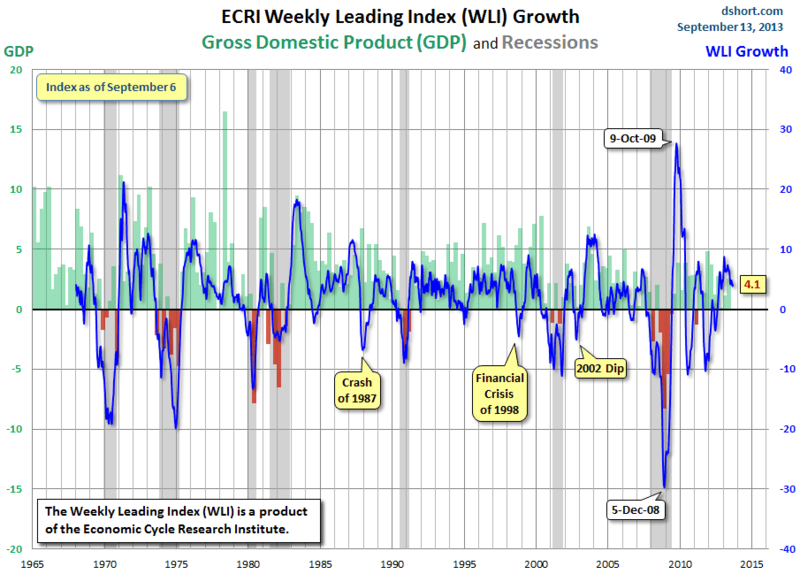 A break-out (whether from wedge, island, level) is the beginning of a change in the market, and charts are nothing more than the depiction of series of changes in the market. You’re right John, it’s good to use a preferred strategy. Top and bottom picking is a specialty like others. I once traded along a guy who was doing exactly this in daytrading S&P. I mean, he was looking at a moving market for hours only to anticipate an entry against the flow. Decisions to enter based on price, his own levels and moving average of ticks. I couldn’t stand it! A drive offers me entries with the flow, I will never wait for the end of it. If it turns, I will jump in again in the other direction, but it must start first. The guy is doing very well and trades for 8 hours a day. I trade from 1 to 2 hours, only sometimes all day long.